I apologize if there are duplicates of what Richard put in. Most of the bridges along the coast had these concrete pillars. 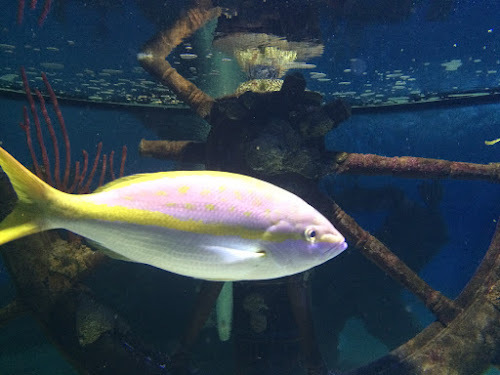 Here is a fish and a shrimp from the aquarium. I apologize if there are strange spaces in this post. All the pictures I wanted to put on came on together all mixed up. Anyway, we spent a night at the Sea Quest Inn, a B & B that had wine at 5:30, and 5 course breakfast promptly at 9:00AM. This is the view of the ocean from our room. I took a hike along the beach and found strange looking things like this. At first it looks just like a round clear plastic lid for sodas at a fast food restaurant. Walking towards the water they were looking rounder. Oh, it is a jelly fish. There were hundreds along the beach. I touched one like the one on the top with my shoe, and it rolled up like used cup cake or muffin paper. These rocks hold tide pools. 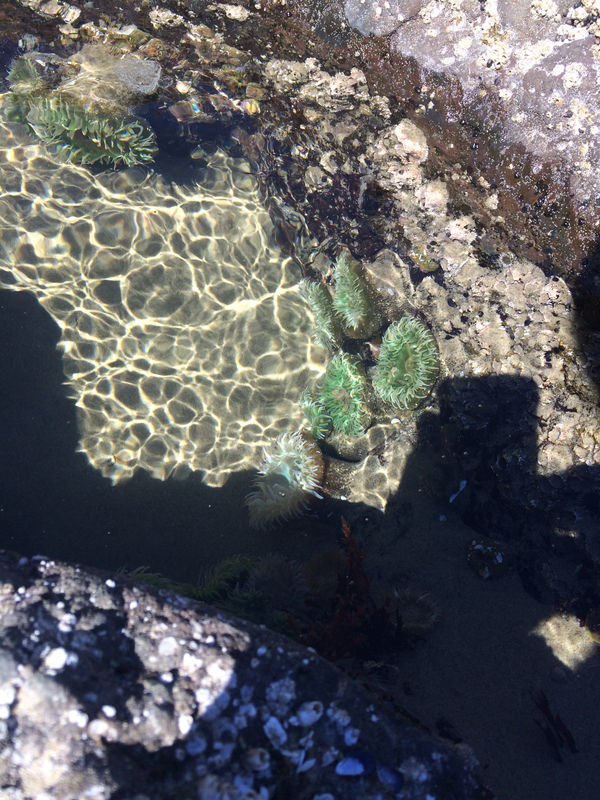 In them I found beautiful green sea anemones. Our host at the B & B suggested Ona's for dinner. In fact, he suggested it to every guest, and called to make reservations for each of us. I wonder if he gets free food there. Richard had a salad with beets and asparagus among other things. Mine was a green salad with crab. I really like crab, but I don't like all the work to get the meat out of the shell. I will be adding more pictures tomorrow! Lots of flowers. Just a few more photos from the Evergreen Aircraft and Space Museum. We got a nice parking space right in front of the museum though I should've asked about parking in the shade. Especially when I overheard two of the volunteer staff members talking about the Ural in the parking lot with Alaska plates. And having pictures on his phone to prove it. 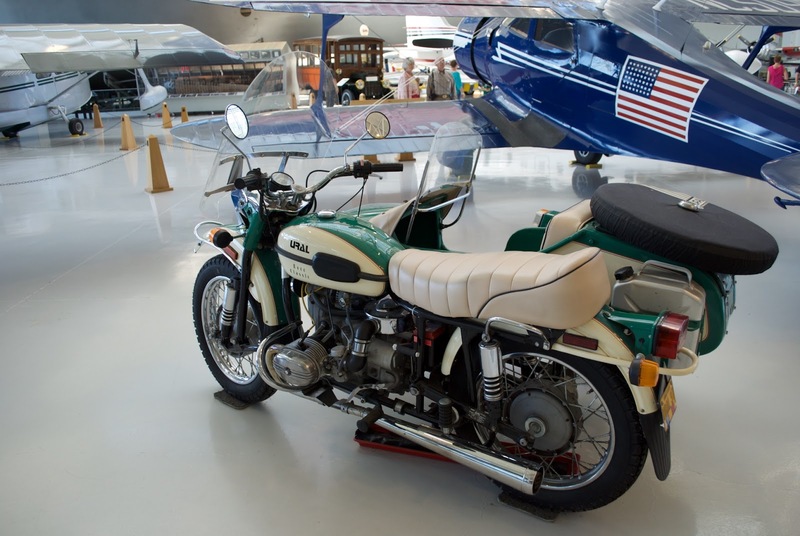 This is the 2007 Ural that was part of the display. The story we heard is that the owner of Evergreen Aviation saw it one day and bought it on the spot. Too bad that it's now just sitting here as part of the museum. Note the tray under the transmission to catch oil leaks. I didn't take a photo of the Gear-Up in another part of the museum. 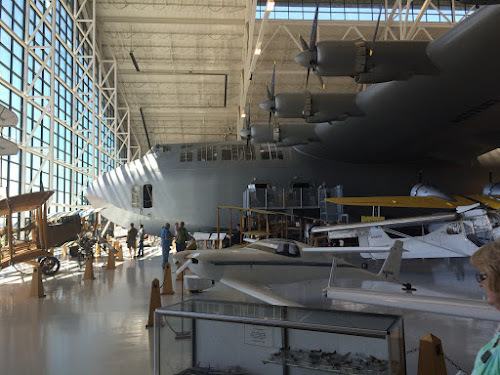 Another shot of the Spruce Goose showing it's size. There are multiple images on the web showing it's size relative to modern passenger planes. The wingspan is over 50% more than a 747 and the length is slightly less. You can go into the hull but to venture into the cockpit is another $25. The museum really needs to raise money to keep these planes around. The original plan was to cut it up and sell the pieces. I'm glad that it's still in one piece. 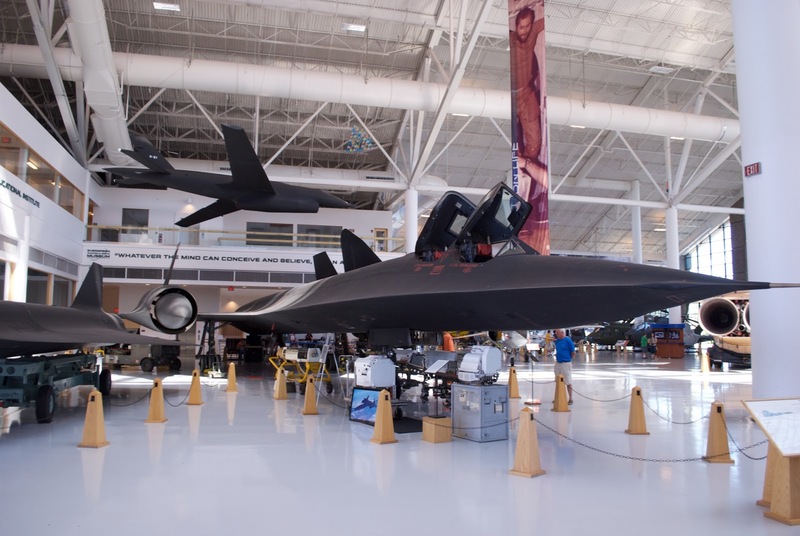 Here is their SR-71 Blackbird. It is on display in the "Space" building instead of the aviation. The only reason I can think of is that they ran out of room. 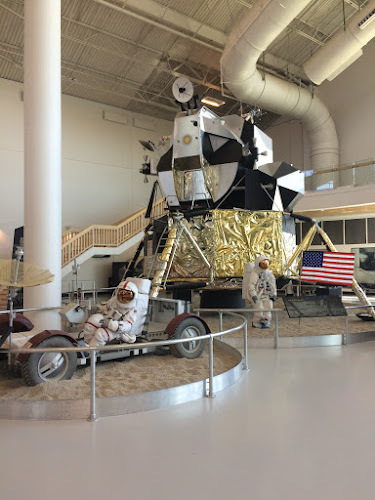 Since there isn't as much concern about the low humidity of air conditioning, the space museum is nice and cool. The Space museum was pretty complete though there wasn't really anything there that I hadn't seen at other times. No pictures from the short ride back to Corvallis this morning. We left shortly after breakfast and actually remembered to get gas on the way out of town. The last couple of days I had forgotten to fill up. On Tuesday, we had to add the contents of the gas can and on Thursday, we found a small gas station literally in the middle of nowhere just after switching to reserve. 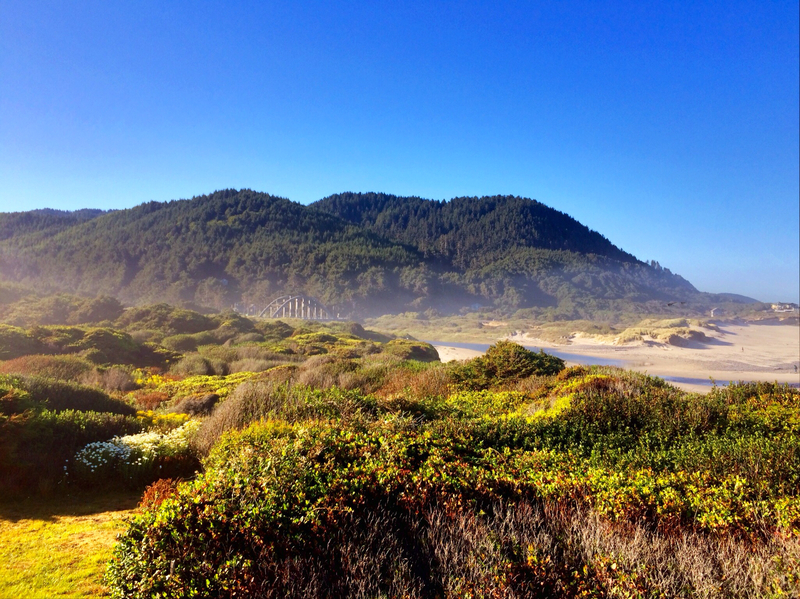 After breakfast at the B&B, we headed out on highway 202 from Astoria. The owner of the B&B said that we woudn't want to take that road since it's way too narrow and there are a lot of tight curves. We're guessing that he just doesn't understand motorcycles. The first 60 miles or so were nice and twisty with lots of shade from the trees. Then we got on highway 26 where everyone was speeding, no shade and the temperature started to climb. 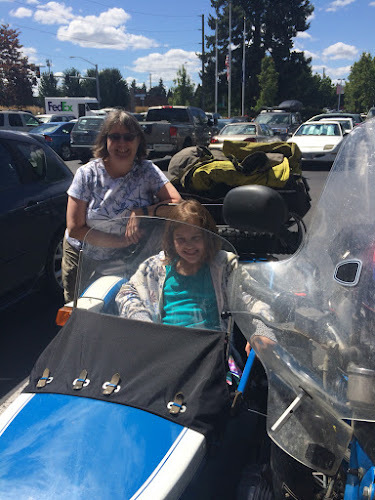 We arrived in McMinnville around 12:30 and headed for the Evergreen Aviation and Space Museum with hopes that it would be air conditioned. By this time it was 99°F according to the OAT on the bike. The aviation museum itself was not air conditioned but it was reasonably cool compared to outdoors. 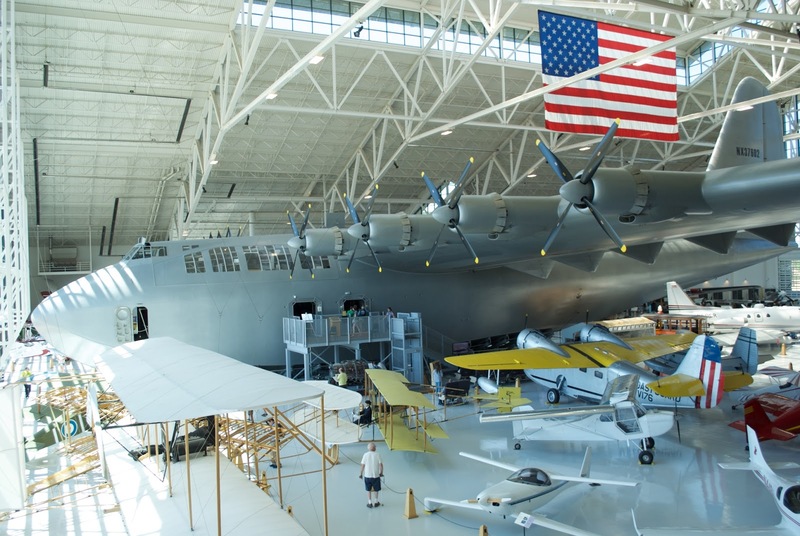 The museum is dominated by the Spruce Goose, the Howard Hughes built wooden transport plane. It was disassembled and shipped from Long Beach by barge then by truck. Some of the sections were 5 lanes wide. A pretty impressive undertaking. The Aviation display included 2 Urals. A 2007 retro and a later model Gear Up. I think the only reason they are there is that they look old. We saw an Imax film on volcanos, tornados and earthquakes. It was a decent documentary and the theatre was air conditioned. Afterwards we went to the space exhibit which is also air conditioned. I took quite a few photos using the dslr there but most of the displays were like all of the other space museums I've been to over the years. At least I can now take pictures of an SR-71 without an MP yelling at us. I first saw one on the ramp at Edwards Air Force Base where it was being refueled back in 1975. We were allowed to walk up to it for a better look but no cameras were allowed. The MP held onto them while we walked around the plane. 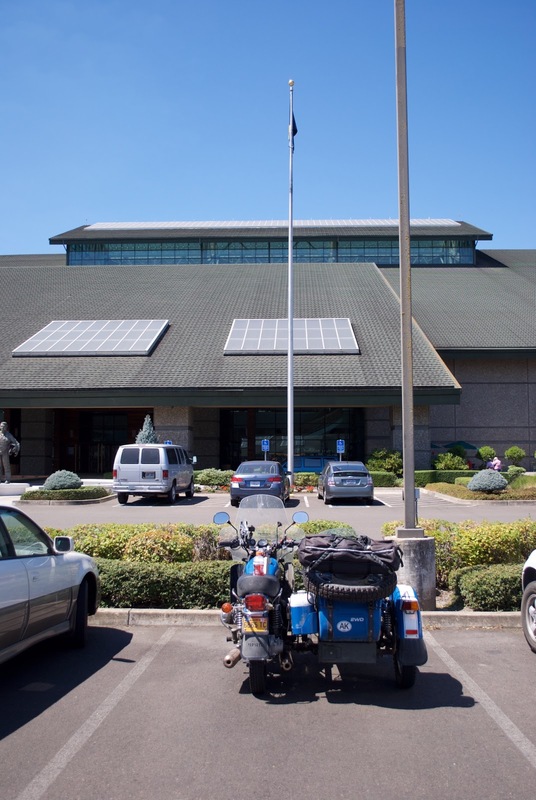 The Evergreen is a great museum in case you've never been here before. And there is even a aviation themed waterpark attached. 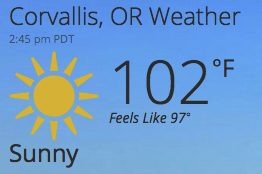 It's now cooled down to only 104°F from a reported high of 107°F. We are at the Comfort Inn about 1.4 miles west of the museum. Clear, sunny and warm was the weather for the day. 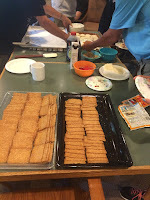 This was about 8 am today as breakfast was being prepared. A slight fog was hanging over the river next to the SeaQuest Inn. No wind at all in the morning though it did pick up by time we took off about 11:30. 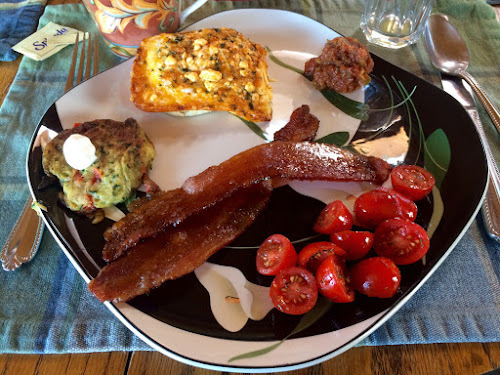 Just a food shot showing part of the breakfast. Not shown was the watermelon and berries with a mint dressing. The jalapeño-peach salsa was especially good. 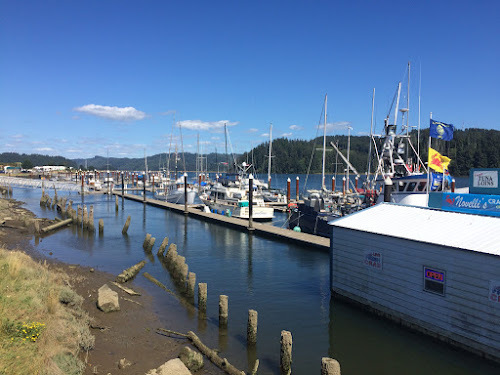 It was about 165 miles to Astoria from the B&B. While underway, the temperature would fluctuate between 64°F and 95°F and 20mph headwind to dead calm. On this section of road, the Ural was not the slowest vehicle on the road and the majority of the drivers don't pay attention to the signs instructing slow vehicles to use the turnouts provided. The trip took almost 5 hours and we're not sure Astoria was worth it. It feels like a suburb of Portland. Very urban. 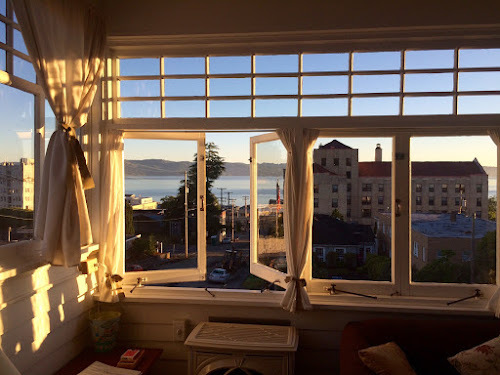 The pic is the early morning view from our room at the Rose River Inn B&B with a view of the Columbia River. The rig is parked below the window next to the site of the first post office opened west of the Rocky Mtns (March 9, 1847). Below is a pano of the Columbia River from the wharf area of the city. Bridget is attempting to take a picture of a few seals sitting on a buoy. Tomorrow, we head inland back to the land of triple digit temperature. 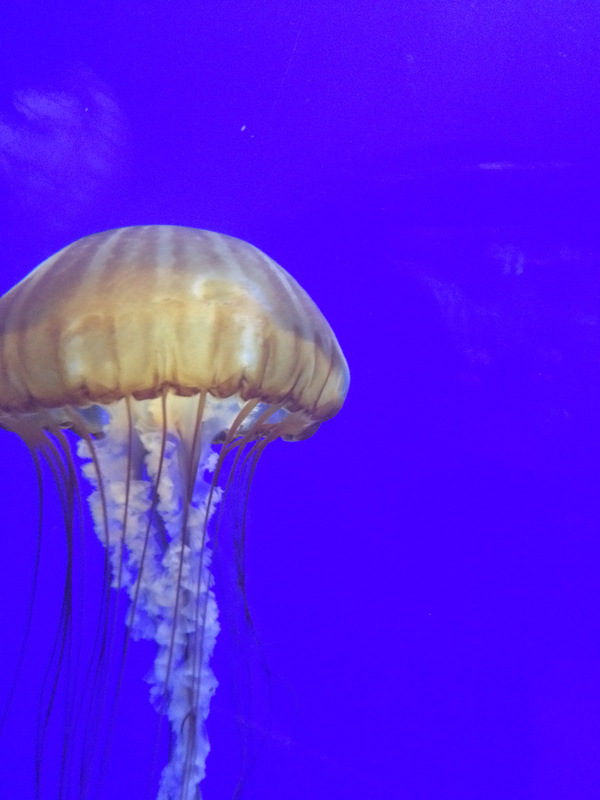 Today, we headed north to the Oregon Coast Aquarium in Newport. 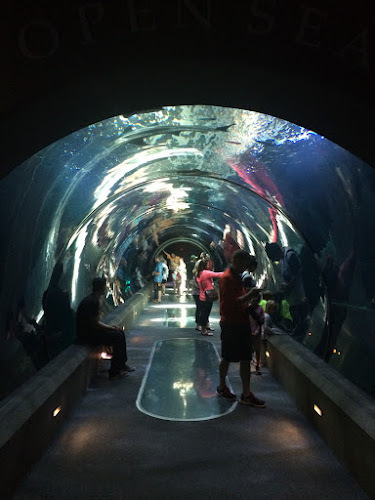 I have been to Newport numerous times though I don't remember going to the aquarium before. None of it looked familiar though some of the displays looked like the Monterey Bay Aquarium such as the jellyfish. I think the MBA even used the same shae of blue to backlight these jellyfish. It was a challenge to take pictures of the many fish as the only way to avoid reflections was to place the iPhone right against the glass and wait for something to swim by. No names of the fish as I don't remember what the sign said. This one actually has yellow stripes but they don't show up very well. This is the first place I've been to that had these underwater plastic walkways. This was the longest of three and the tank had the sharks in it. There were viewing ports in the floor but not enough light got down there to see much of anything. We did find two geocaches at the aquarium. One inside the gate and one just outside. 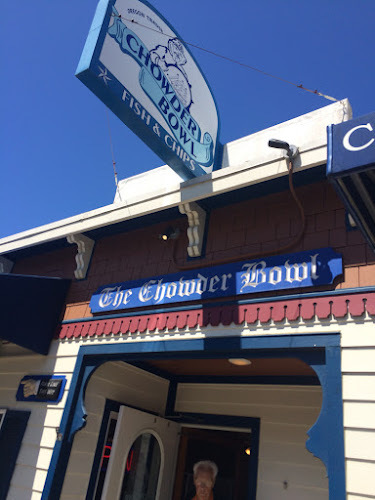 About 1pm, we started to look for lunch and Trobairitz left a very timely comment on my last post letting us know about the Chowder Bowl near Nye Beach in Newport. There was a line but since there were only two of us, we didn't have to wait long. I had the chowder and an oyster sandwich. No photos as they didn't sit around very long. After lunch, we headed south to our B&B called the Seaquest Inn. Very nice place right on the beach. Low tide was late afternoon so we walked out our patio door onto the beach and down to the tidepools. Most had sea anemones and lots of jellyfish. The last photo is a pano from about 30m from the patio door. Added: Sunset video from the B&B. Hello everyone. It was requested that I post, too. The reunion was a success, as usual. There were field games, Japanese dancing, swimming, hiking, crafts, and lots of good visiting. When we left they crowded around us taking pictures. As tradition goes, some left overs go to a local restaurant for lunch. This was at a brewery that is made of many buildings including the restaurant, hotel, gift shop, golf, gardens, and beautiful flowers. I enjoyed the trip there smelling a lavender field, and trees. Today we went to Eugene to visit a friend of mine that used to live in Fairbanks. On the way there we passed a mint field. mmmmmmm. We are now in Florence, OR. Here is an otter I saw. I enjoy painted outside murals. Oregon is very dog friendly. Here is a water fountain for standing ppl, wheelchair bound or shorter ppl, and one for dogs. 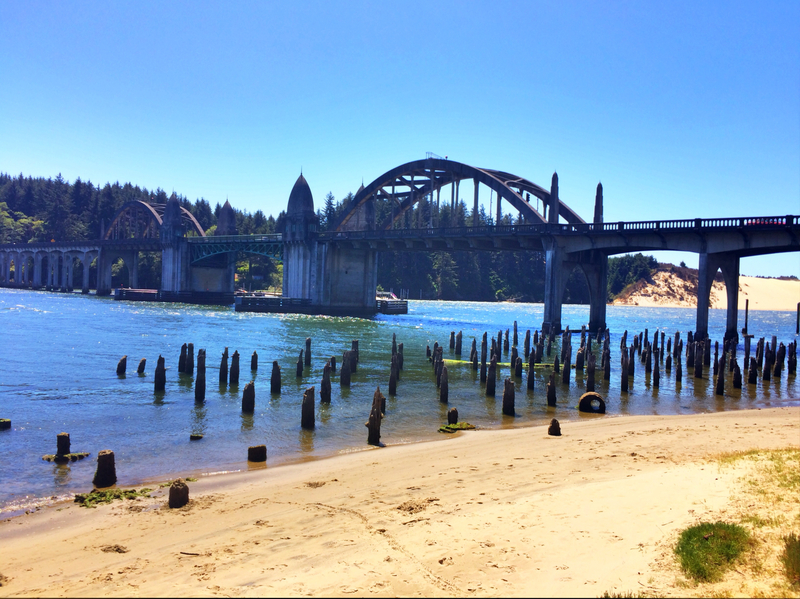 Today, we rode to Florence, OR, with a lunch stop in Eugene. Bridget visited with a friend from Fairbanks and her daughter. The trip from Eugene to the coast was on a winding, tree lined highway. The Ural was easily able to go the speed limit but lots of cars wanting to go a lot faster than that. Florence is a nice seaside community. Kind of "touristy" with a lot of art galleries and gift shops. All of the rotting pilings in the photo are the remnants of the old ferry dock. I think the bridge opens up for large boats to pass through it but we never saw it actually open up. This picture was taken in Eugene right after lunch outside of the restaurant. The Ural just seems to attract attention. Lots of comments from people passing by. During the family reunion, several had asked for a ride but it was raining on Saturday plus a lot of activities so no rides. For this part of the trip, no camping, and no camping equipment so the only luggage is a waterproof duffle attached to the rear rack. When stopped, both helmets and our riding gear easily fit into the sidecar and can be covered with the tonneau cover. The small boat harbor is pretty small compared to some others like Seward. There were quite a few crab pots stacked up on the dock so I'm looking forward to dinner. As you can see, we are having beautiful weather. Dinner was at ICM, A seafood place right on the docks. It was alright, not great, but a whole lot better than the Yelp reviews indicated. Maybe I have low standards. Here is the waterfall that we had walked to on Saturday morning. 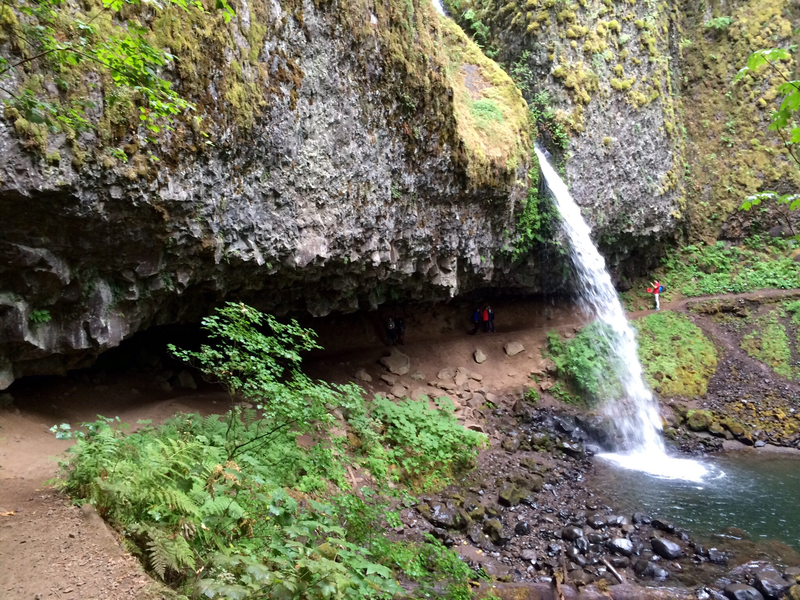 I believe that it is called Upper Horsetail Falls and also referred to as Ponytail Falls. It was only a ½ mile or so from the parking lot but was far enough for some in the group as the trail was steep and rocky. To give some idea of the size of the cave, you can see several people inside of the cave. Today, Sunday, was the last day of the reunion and as is our tradition, we met at McMenamins-Edgefield for lunch. 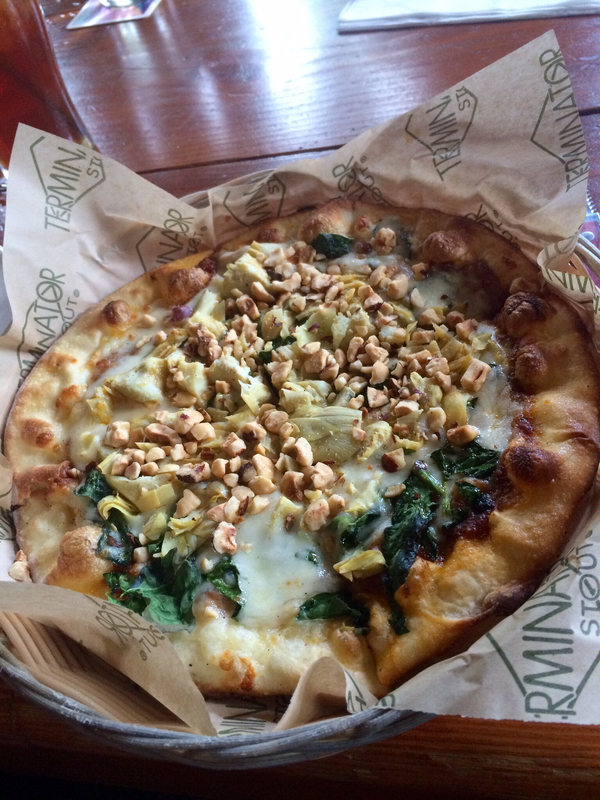 Bridget and I shared the hummus plate and this small pizza with artichoke hearts, spinich and hazelnuts. Pretty tasty! Afterwards, we looked for a couple of geocaches before gearing up to try and beat the rain. We only had a few sprinkles on the way to Corvallis and though it did rain shortly after we arrived back at my mom's home. Tomorrow, we (note the "we") head for the Oregon coast. 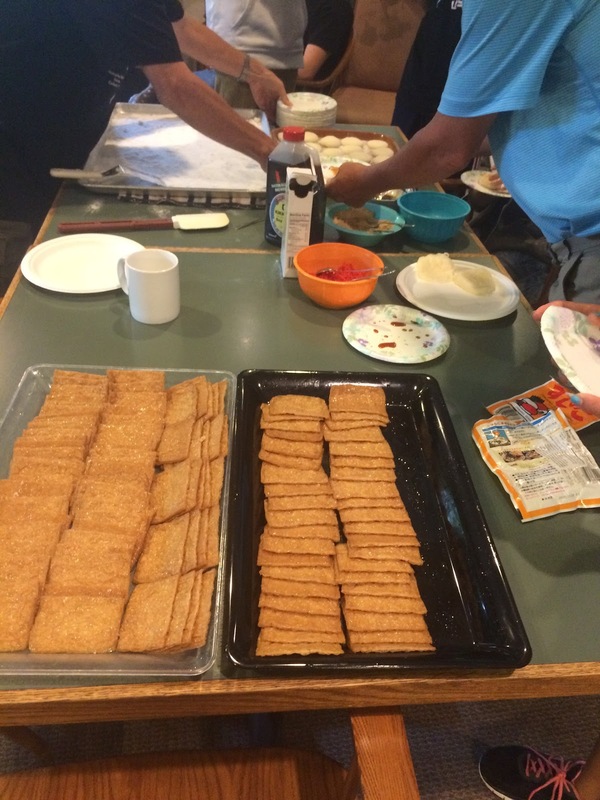 Reunion activities continued including making inarizushi and mochi. The inarizushi is a type of sushi made from seasoned Aburaage tofu pouches. The rice is sushi rice in this case mixed simply with black sesame seeds and packed into the pouches. This was a type of sushi that even young kids like as it is simple and the tofu pouches are a little sweet. making sushi has been a tradition at just about all of the family reunions some more complicated (and expensive) than others. 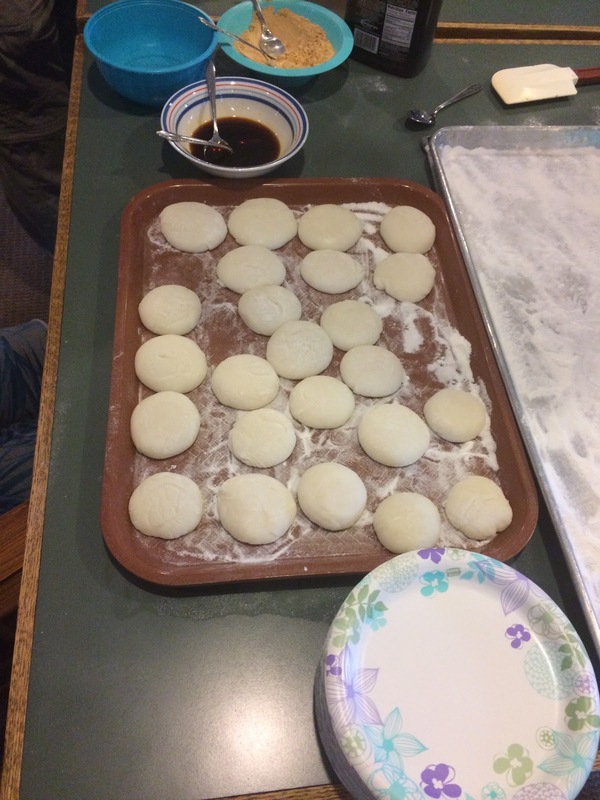 Mochi is made from glutenous rice pounded into a smooth paste. This is formed into little patties. In this case, one of my cousins brought their mochi maker, kind of like a specialized Japanese appliance. There was some frozen mochi that was made earlier and this was fried after thawing out. My niece and I took charge of that task. It was a real toss up which I preferred. The slightly toasted crust of the fried version was nice but the freshly made version was very good. I preferred just using a dipping sauce made from sugar and soy sauce. In this photo, the sushi rice was in the process of being made. 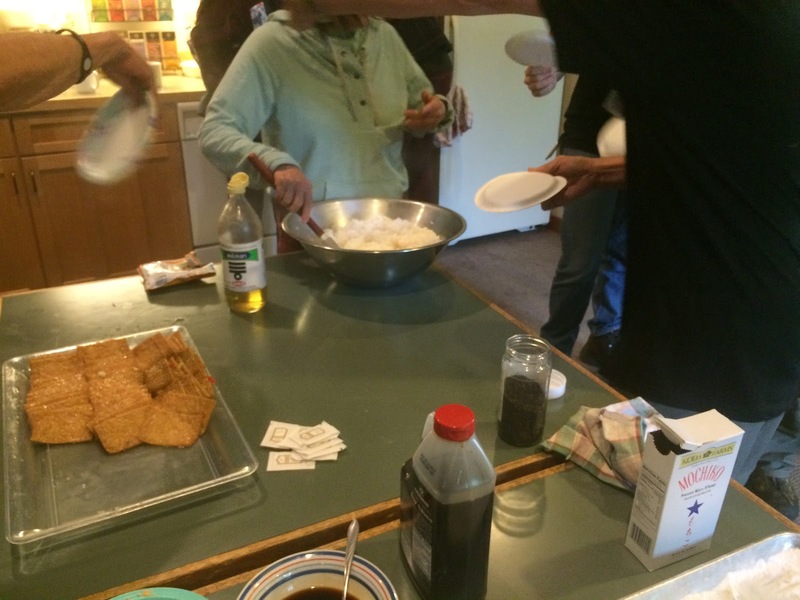 The freshly made rice is cooled by fanning and a mixture of rice vinegar and sugar is mixed in. Not enough to make the rice wet but you want a nice shine on the surface. There were plenty there with lots of sushi making experience and it was heartening to see the younger generation there to pick up some of the techniques and learn how to make the sushi rice. 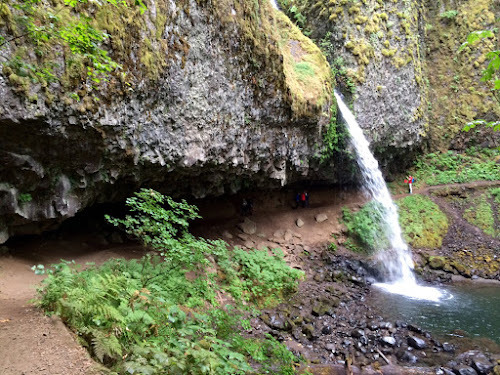 One of the other activities was billed as a short, easy hike but as my cousins son Eric pointed out, it's really difficult to find a "flat" hike in the Columbia gorge. I didn't have my phone or camera on the hike but Bridget did so she may do a post later.